Bangladesh Agricultural University Vice Chancellor Prof Dr Md Ali Akbar opens an ATM booth of Pubali Bank on the varsity campus in Mymensingh recently. Bank’s Managing Director and CEO Md Abdul Halim Chowdhury was present on the occasion. 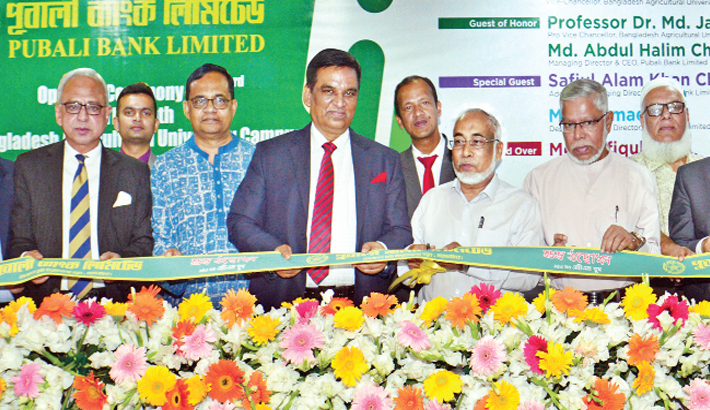 Pubali Bank Limited opened an ATM booth on Bangladesh Agricultural University premises in Mymensingh to provide modern and digital banking service for the customers recently. Prof Dr Md Ali Akbar, Vice Chancellor of Agricultural University inaugurated the booth as the chief guest, said a press release. Professor Dr. Md. Jasimuddin Khan, Pro-VC of Agricultural University and Md. Abdul Halim Chowdhury, Managing Director and CEO of Pubali Bank Ltd were present as guest of honour.